Using Jamaican-British dub poet Linton Kwesi Johnson’s 1978 poem It Dread Inna Inglan as point of departure, Tate Collective London have curated 2017’s first Late at Tate Britain responding to a display of newly acquired photography, Stan Firm inna Inglan, reflecting upon and reinforcing the important long-standing contributions made by African and Caribbean migrants to the UK. Since mass migration to the UK beginning with the Windrush generation, various areas of Black-British cultural production have either been forgotten or misused. You are invited to experience this night of rediscovery and mediation of the music, literature, moving images, visual art and political engagement from a growing community who have moved from strength to strength despite displacement, social exclusion and state violence inna Inglan. Touching Bass is a family of South London-based soul disciples focused on forwarding the legacy of black-oriented music. As well as throwing monthly offline dances, they also hold down residencies on NTS Radio and at Dalston’s Brilliant Corners. Take a moment to join them as they lead a sonic trail through the sounds of Afro-Caribbean London past and present. Touching Bass include Alex Rita, Andwot, Born Cheating, Sammseed, Shy One and Wu-Lu. A rare chance to hear esteemed Tate collection artists including Syd Shelton, James Barnor, Neil Kenlock and Dennis Morris discussing their extensive catalogue of work, made against the social and political backdrop of the times with social historian Emma Dabiri and Tate Collective London member Rianna Jade Parker. An intergenerational panel discussion exploring the importance of club spaces, the influence of sound systems as well as early pirate radio stations, such as Dread Broadcasting Corporation and Kiss FM. Speakers include DJ, music producer, entrepreneur and founder member of Soul II Soul, Jazzie B, seasoned producer and DJ, K15 and Touching Bass DJ’s Mali Larrington-Nelson and Errol Anderson. A poetic response from spoken word artist Kareem Parkins-Brown inspired by the Stan Firm inna Inglan display. A video diptych based on research carried out while poet-in-residence at the George Padmore Institute. The piece addresses the relationship between contemporary media and reality by placing fractured news archives from the time of the New Cross Fire in 1981 beside a roving, skittish eye. Despite nearly forty years since the tragedy, the headlines shown – and the problems discussed around rising fascism, state violence and police indifference – are eerily familiar. Both images are accompanied by recordings from the public meetings held at the Moonshot Club and elsewhere in New Cross to discuss the botched inquest that followed the fire. Featuring the voices of the recently departed Darcus Howe and the late John La Rose. Music by Jake Kalmanovich. Drop in, dress up and have your photo taken at a makeshift 60s -70s fashion studio inspired by James Barnors’ seminal Ever Young street studio. With a selection of clothes hand picked by one of London’s best second-hand vintage shops, the East London Thrift Store. Tate Collective London invite you to kick back and explore books relating to Black British experience in The Living Room, a set made by Freya Newmarch and Frankie Markot in consultation with Michael McMillan, the author of The Front Room: Migrant Aesthetics in the Home (Black Dog 2009) and curator of The West Indian Front Room (Geffrye Museum 2005-06), for the BFI in 2015. With special thanks to Wimbledon College of Art for supporting the recreation of the set. See the works which inspired the event in Stan Firm inna Inglan, a free display featuring works from the 1960s and 1970s by eight photographers who documented Black communities in London. 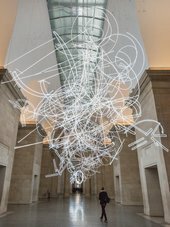 Late at Tate Britain is curated by young people from Tate Collective London, part of Circuit, led by Tate and funded by the Paul Hamlyn Foundation. Keep up with the latest from Tate Collectives on Twitter, Instagram, Facebook and Tumblr. Please note tickets are required to enter the David Hockney and Queer British Art exhibitions.